I’ve been given the go ahead to share my book cover with you! AAHHHH!! I’m just a wee bit excited, can you tell?!? She moved to Sandwich, Illinois, in search of a new life, but ended up in a giant pickle. the eleven-year-old brother Maddie wants to spring out of foster care. arranged, risking her heart to Reuben in the process. And she’d rather eat a million corned-beef on rye sandwiches than do that. So… what do you think?? And if you didn’t see yesterday’s post… my book is now, officially, for sale!!!! It’s listed on Amazon, Christian Books, and Books a Million! (I don’t believe you actually are charged for it until it ships in September… although that might vary upon sight, and obviously if you’re an eReader that will be available later too!) Also, I checked today, and my cover is showing on Christianbooks.com! I think I might have to pinch myself… for so long it’s felt SO far away and now it’s getting REAL! AHHH!! Okay, I’ll settle down now. I think Jesus KNEW I needed this excitement this week. In fact I know He did. Yesterday was a tough day… but God is FAITHFUL and *sigh*. He knows what we need! Oh my goodness, Krista, my jaw literally dropped when I saw the cover because I love it! It's so eye-catching! So, so, SO exciting, girl!! Congratulations Krista! The cover looks great! 🙂 So excited for you! Krista, the cover is great and the blurb is even better! WOW!!! Can't wait to read this. Thats Awesome Krista! BTW, we live about ten minutes from Sandwhich, IL! How fun!!!!! I was born in Sandwich IL and lived there until I was 5 (and still have a ton of relatives on my daddy's side there) Haven't been back in a while unfortunately but I has a TON of memories there! Absolutely gorgeous cover, Krista! Can't wait to read it. So happy for you! CONGRATS!!!! I can't wait to read your book! Woo Hoo! Your pic. really moved me too. I know you know what I'm referring to. Woohoo!!!! I'm pinching myself for you! 🙂 How exciting! Love your cover, love the blurb. Can't wait to read it! Pre-ordered yesterday! Yay! Can't wait Krista!! Congratulations!! Amazing book cover. Absolutely love it. Very eye-catching. So very excited for you Krista! We know what it's like to have a dream and see God do the miracle to make it happen. You get to watch it slowly unfold and then bang it all starts happening at once. So get ready to hang on for the ride. ( ; Hab 2:3 For the vision is yet for the appointed time, and it hasteth toward the end, and shall not lie: though it tarry, wait for it; because it will surely come, it will not delay. I'm so excited for you! To see your name on that cover, my friend, is just plain SWEET!!! You're so official! Real! An actual, have-a-book-for-people-to-buy author!!! WOW, KP!!! WOOHOOOOOO! I'm So, So excited for you!!!! 🙂 Can't wait to read it. The blurb is adorable and so is the cover. The book cover looks AWESOME! Especially the whole "Krista Phillips" part, lol! Congrats! Definitely pulls you in! Can't wait to read it! Congratulations!!! I can't wait to read it. Oh wow! I'd forgotten you were having a book published! Whoo hoo!! Will order! Woo Hoooooo!! It looks awesome, Krista! How very exciting. Can't wait to get it! Congratulations, Krista! That cover totally rocks. I love it. And the blurb? Awesome! I'm soooo looking forward to reading this. I am sooo excited for you, Krista! It couldn't have happened to a cooler person. You are soooo cool, you know. And one of my favorite people EVER. *blush* You are too much my friend… but sweet! And one of MY favorite people every TOO!!! THANK YOU everyone!!!! Your support and excitement with me has meant SO SO SO SO much!!!! Thanks for celebrating with me! What wonderful news! The cover is soooo appealing! I love it! I can't wait to read it. It seems like such a tease after reading the blurb and September seems so far away. I know what people are getting as gifts from me this year! Best of wishes (and we're still praying). LOVE the cover! And the story sounds great! Much success to you, Krista! Congratulation to you! The cover is awesome, and I know you must be just bursting with excitement! Now, hopefully you can get Annabelle home! Catchy and fetching at the same time. LOVE the title, and the blurb is even better. Also love the hero's name…Reuben. Nice play on words. 🙂 Congrats on the pre-order and upcoming release of your debut novel. God does have a great way of giving us blessings like this in the midst of trials. His timing is always perfect….even when we doubt it at the time. How cute is that? The cover, the premise, the blurb. Super-cute. Can't wait to read it. Congrats, Krista! 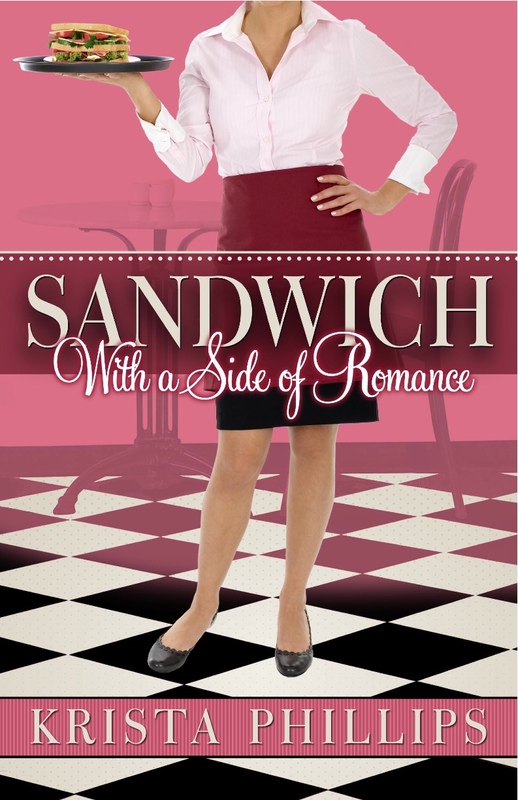 This sounds like a really fun read – love the fact that the Sandwich shop owner is named Reuben! 🙂 And the cover is great! How did that S get capitalized? Oh, and I wanted to add that I'm praying for your little one. Hugs. Kara!!! I'm totally curious what judge you were! HA HA HA! I'm excited that you get to read it in September too, ha! Of COURSE I had to pop over here and say CONGRATS on that too-cute cover and ever cuter story-line. And love those babies of yours. Ever' stinkin' one of them. I hope I'm not too late to shout: CONGRATULATIONS!